Do you have the "blue box blues"? Have you been craving a delectably ooey, gooey bowl of noodles paired with a borderline irresponsible amount of cheese? Do you daydream of lounging by a pool of golden liquid cheddar on chairs made of elbow-shaped pasta? Wow, stop being weird! Mac 'n cheese is super easy to get, especially when you have this handy list of Dallas's best bowls. And skillets. Look, "Mac" is even in the name! Though oddly enough, penne is actually the pasta of choice for this North Dallas, almost-in-Plano watering hole. Sure, plenty of folks are drawn in by the fine 14-strong tap list, but the star of this show is a piping hot bowl of said pasta doused in a smoked Gouda-based sauce and topped with just the right dusting of breadcrumbs. 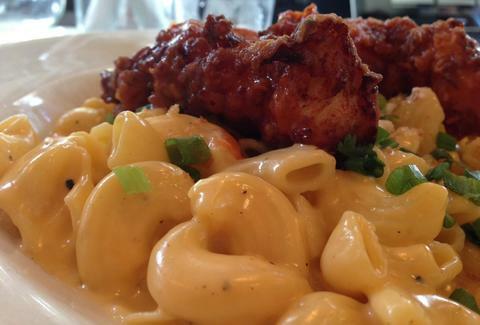 With Slow Bone serving up some of the the best BBQ in Dallas, it’s hard for a side dish to stand out -- but the mac 'n cheese here manages to do just that. 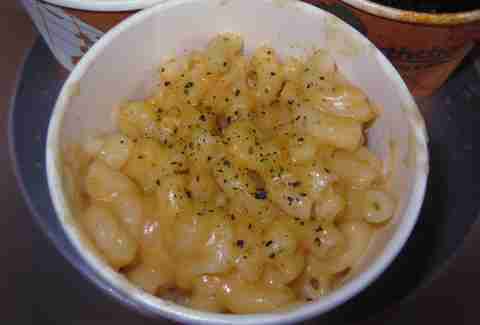 The diced green chiles give the crazy creamy mac just the right hit of heat. Want to get really crazy? 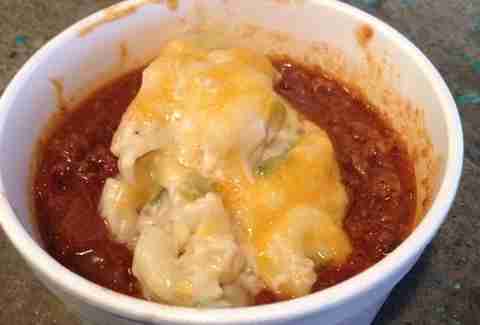 Combine it with their chili for yet ANOTHER hit of heat, and you've got the delicious meat/cheese power duo that is the Chili Mac. Hattie’s puts four different types of cheeses (pepper jack plus sharp, white, and smoked cheddar) in its standout, skillet-served Mac & Cheese. Much like in Captain Planet, when their powers combine, something truly beautiful happens. If you want to really take it up a notch, they do a Mac & Cheese Crusted Filet that pairs beautifully with... another side of Mac & Cheese. Another Bishop Arts staple, Chicken Scratch not only has some of the best mac out there, they have one of the best places to eat it. 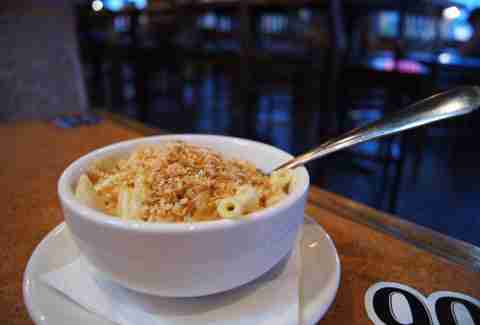 Hop over to The Foundry for a drink and cozy up at a picnic table to indulge in some of their Green Chile & Hominy Mac N Cheese. Just like Slow Bone, the green chile does wonders for the flavor, and the hominy adds a surprisingly welcome change of pace when it comes to the texture. 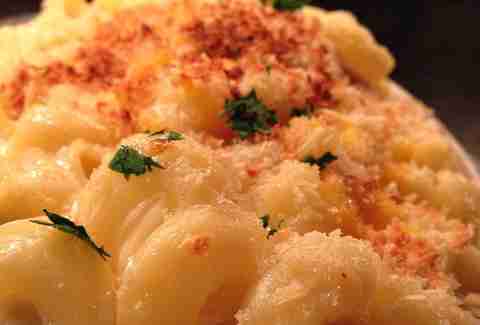 Modest proposal: rename the Bishop Arts District the Mac 'N Cheese District. Oddfellows' rendition is a spectacularly creamy and tasty example of cheese artistry on its own, but, as a bonus, it comes topped with buffalo-drenched chicken tenders. From bite number one, you quickly realize this was a pair that was made to be together, like Romeo and Juliet, except nobody dies in this example. Well, the chickens do. And you might, eventually, if you eat too much. Still, the analogy holds. 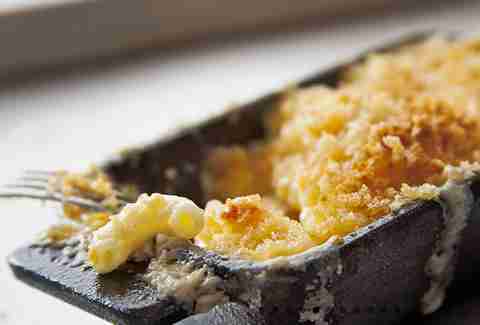 The Porch stands out in a different way on its quest for the greatest mac 'n cheese of all time -- by serving the dish in casserole form. This baked delight comes with chunks of smoked ham thrown in the mix, along with a "what-have-I-gotten-myself-into" level of creamy béchemel sauce and plenty of Parmigianno-Reggiano. It's no surprise this particular dish has legions of devoted, often heavy fans. If you wish to join them, finish off your hearty meal with a slice of their warm butter cake. 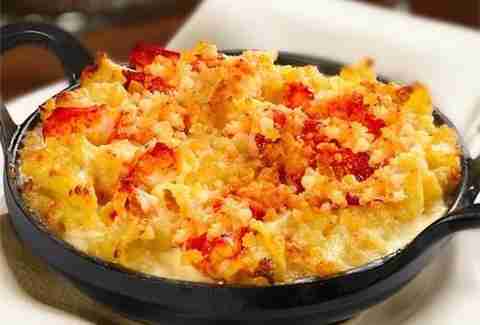 We don’t always suggest spending $17 on mac 'n cheese, but when we do, it comes from Capital Grille and it has lobster in it so the price tag becomes quite reasonable... Coming in a cast iron dish that could double as a life boat -- you know, if cast iron could float, whatever, shut up -- this stuff is pretty habit forming, so be careful unless you can afford a potentially debilitating steakhouse habit.